Hey pet-loving fans! How many of you enjoy reading books that feature dogs or other animals in the main story? I love these light-hearted reads, especially when I am in need of some quiet downtime. I don’t watch much television so I often find myself searching online for books recommended by other animal lovers. I’ve come across several great books that way, which includes the most recent book I read, Dogtripping by David Rosenfelt. 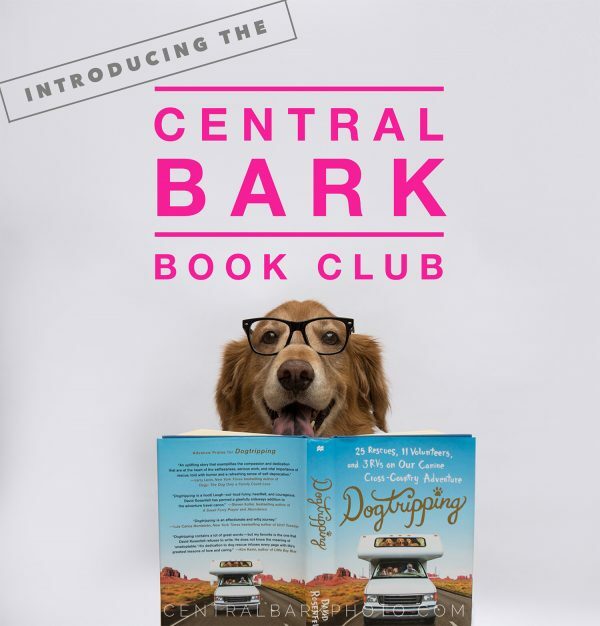 And because I really enjoy these types of books, I thought it would be fun to start the Central Bark Book Club! I’ll share some of the books that I’ve read that I think you all might enjoy, and I’d love to hear of good books you’ve read as well! So let’s jump into my first book recommendation! When single, non-pet owner David Rosenfelt met Debbie Myers, the dog mom of a golden retriever, he had no idea just how much she would change and furfill his life. (See what I did there?) 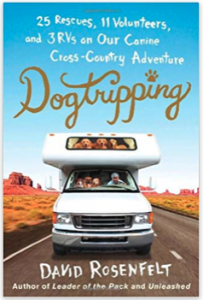 In this true story of their 2011 cross-country move from Southern California to Maine, David comically tells the story of how they were able to comfortably move their 25 rescue dogs with the help of 9 volunteers via 3 rented RVs. How it all began…. When Debbie introduced David to her golden retriever Tara, he quickly became fond of her, expressing that Tara had to be the best dog in the history of the world. When Tara passed a year later, Debbie and David promised her that they would help other dogs in need, creating The Tara Foundation in her honor. They became passionate about rescuing dogs, most specifically golden retrievers, from the overcrowded and underfunded animal shelter system in and around Los Angeles. Over the years, they rescued and fostered over 4,000 dogs, finding most of them loving homes and keeping the rest to join their pack. At times, they had 30+ dogs in their care, mostly hard-to-place, large, senior dogs who could enjoy their twilight years in a loving home. But as retirement approached, David and Debbie purchased a home near Damariscotta, Maine. Their move would be anything but typical since they needed to figure out how to move 25 dogs coast-to-coast. Once David had considered every plane, train, and automobile option, he finally found a solution! He came across an RV company who permitted dogs on board and as a bonus, the RVs could be picked up in Southern California and returned on the East Coast. He was able to recruit 9 other passionate dog rescue volunteers, who collectively, took turns at the wheel and managed timely bathroom, meal, and rest breaks in order to make it across the country in 5 days. Woven into the story of their cross-country adventure, David shares tales of some of the many dogs they have rescued over the years. The stories pull at your heartstrings, with tales that will make you both laugh aloud and shed tears. Because David and Debbie spent so much time volunteering and being a part of the animal shelter system, he also pulled back the curtain on some of the day-to-day activities. A few of the stories really broke my heart. But he is being real, sharing how some dogs end up in shelters through no fault of their own. Some dogs started their lives in homes, only to be discarded to a shelter later in life because someone found it to no longer be a cute little puppy or too old to be a running partner. But David keeps most of the story upbeat, humorous and heartwarming. I admire and applaud David and Debbie. With their passion and promise to Tara, they helped save thousands of dog’s lives. It is an amazing feat to house, feed, take to the vet, keep track of medications, groom and clean up after SO many dogs, yet give each one individual attention so they know they are loved. It takes great organization and a huge heart to care for so many dogs. I thoroughly enjoyed this book and recommend it to dog lovers and those involved in animal rescue. —–> Also, if you are looking to add a new pet to your family, please, please, PLEASE consider adopting a pet from your local rescue or animal shelter. There are thousands of wonderful and amazing pets available on Petfinder.com, where we found two of our adorable, entertaining, loving, funny, and loyal furry family members. I could not imagine life without them – oh how standard it would be. There are so many great pets in need of a loving, forever home. * This post contains an affiliate link. Previous Post Red, White & Blue Frozen Dog Treats Recipe Next Post Freddy’s Dog Birthday Party! I’ve read all of the books in this series. Loads of fun! I’m presently reading his most recent book in the series, “Rescued”. Love Andy (main character) and his “in your face” attitude that can turn people off. But he’s a brilliant lawyer. Andy loves animals, especially his dog Tara – whom David Rosenfelt says will never die! Andy has a foundation where his inherited money rescues and cares for homeless pets. Much like David who rescues large dogs and, at one time, will have 15-20 dogs in his house and on his bed! Any book in this series is worth reading. Can you even imagine having that many dogs in your bed?! I sure can’t! Our yorkie must think we are sharing HIS bed because he alone makes sleeping challenging enough, LOL! I love these books too! Reading “Play Dead” currently. If you are a dog lover and who isn’t seriously these are easy reads curled on your couch (with your dog of course) or at the by the pool. I have also read “Dog On It” by Spencer Quinn, stories of Chet and Bernie. Similar style and fun. Love your idea of Book Club for dog lovers. Cute concept of the book club! I’d definitely be game for following along! I’m not a big reader but love audiobooks so I’m adding this to my list. I love that they found an RV company who allowed dogs so they could make that huge difference to the lives of all those shelter dogs. We hired an RV a few years ago and snuck our three dogs on and spent two weeks travelling down to Victoria and along the Great Ocean Road (Australia) and it was the most amazing experience being able to have our three little rescue dogs take it all in with us. We spent two hours forensically cleaning every little white dog hair before we handed it back and they were none the wiser… in fact, the van was cleaner than when we first picked it up. Thanks for sharing this review and I love that you’ve started a book club Kristy! Hi Jo! I bet your two week RV trip was an amazing adventure! I’m sure your #3dogkateers LOVED being able to join you guys. I laughed at the thought of “forensically cleaning” and envisioned you and NL going through 10 rolls of duck tape to swipe every cloth surface. In some cases, dog hair is worse than glitter. Glad you like the book club idea and I appreciate you stopping by to say hi!